I am finding a common bond among vegetable gardeners around doing something special with their first ripe tomato of the season. What do I do with my first tomato? I like to carefully pick the first ripe tomato, wearing special soft, cotton gloves to avoid any bruising of the tomato. Then I place it on a lacy satin pillow and reverently carry it into the house, where it is placed on the counter to be admired and also weighed, measured and photographed. Then I carefully record in my "Book of First Tomatoes", what type of tomato it was, how big it was, when I picked it, how I felt when I picked it and what the weather was like. Once I've recorded all that information in the book, I use a special silver tomato knife to slice the first tomato open. Once I've sliced the first tomato with my special silver tomato knife, I carefully transfer the tomato to a china plate, which is only used for eating the first tomato. The plate has little tomatoes painted along the edges, and is just big enough for one tomato. Then, using a once-a-year special occasion silver first tomato fork, I carefully eat the tomato one slice at a time, savoring each delicious bite. Once I've completed eating the first tomato, I carefully wash the plate, knife and fork, update the book with my reflections on how the tomato tasted, and then put it all away until next year. Sometimes in the winter time when fresh tomatoes are but a memory and the snow covers the garden, I like to get out my Book of First Tomatoes to remind myself how good that first tomato really tastes. Okay, you've figured out that I am kidding, right? I hope so. I'm not that nuts! Actually, I generally harvest and eat the first tomato all in one motion. Pick, and begin eating, like it was an apple. No salt, no sugar, I do wipe it off first. I don't even leave the garden. It's good that way, nice and juicy and warm. But, I really have noticed across all the gardening blogs that most vegetable gardeners, including me, do seem to have a special feeling about the first ripe tomato, and most try to do something special with it. At the very least, if eaten with other food, like on a bacon, lettuce, and tomato sandwich, everyone seems to want to use only the freshest ingredients to make it a special meal. 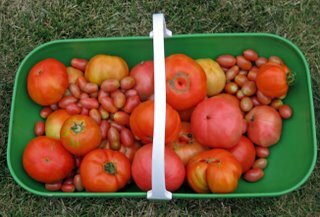 Then, when the tomato harvest starts to look like this, everyone's just trying to figure out what to do with all of these tomatoes! What do you do with your first tomato? You are just having too, too, much fun with the food photos here, Carol. You'll be spraying everything with glycerine and calling yourself a professional vegetable wrangler if you're not careful! Actually, the first ripe tomato was found squashed and rotting under its plant; I guess I missed it ripening! Time for a trim. Ah! But do you dress the tomato with a little bit of salt and maybe some extra virgin olive oil? LOL! I'm so glad that you said you were joking... I had wondered if it was tongue-in-cheek, but with the photo and all i just wasn't sure. I eat mine the same way you do, in one fluid motion after brushing it off if needed. Cut it in half, sprinkled with salt (sea salt, from the salt mill), and shared with my husband. I was ready to disown you when I started reading that description. It's a good thing you were kidding. I picked the first tomato this week too. I went straight inside, rinsed it and sliced it to eat. Could you print your salsa recipe? Should I be concerned that someone in my own family even THOUGHT that the ritual of the first tomato was a true story?? By the way, I harvested my first tomato way back on July 19th. 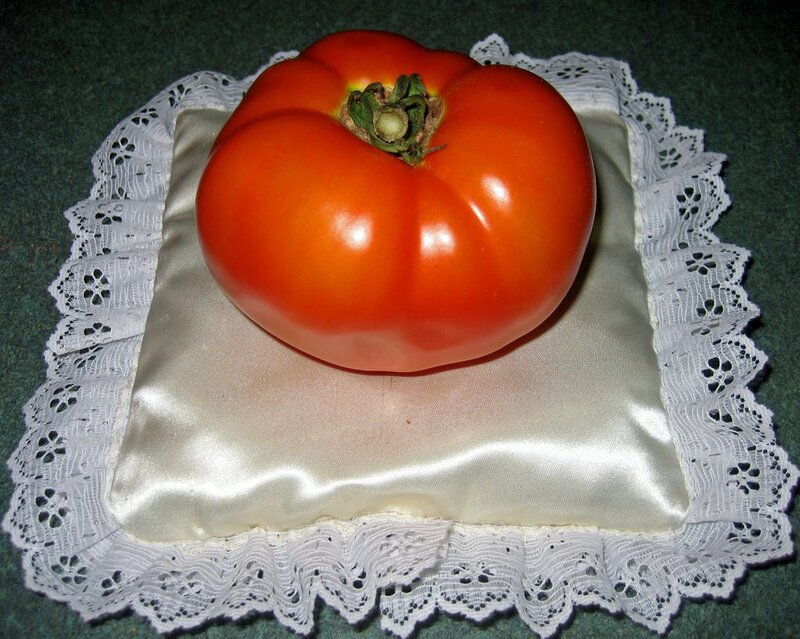 The tomato on the satin pillow is merely a "representation" of a first tomato. I was beginning to really worry about you until you admitted you were kidding. I was thinking that you had gone too far with your gardening fetish! Fetish? I prefer to use the word "passion" to describe my interest in gardening. Since my first tomato is usually a cherry tomato, I just pop the first one (and 2nd and 3rd) in the mouth while in the garden - taste testing to make sure they taste alright. And then the first "full sized" tomato? As you mentioned, mines usually in a BLT! MMMM! We have a tomato plant on our deck in a barrel and the first tomato is JUST about to be picked...it's now that nice orange color right before being ripe enough to pick...I'm SOOOOO excited as this is our first attempt at growing them. We bought a plant to start us off this year. FUN FUN FUN. I did take a picture of my first tomato. It was my first tomato ever. My dad used to grow tomatoes and now that I have a garden of my own, I have tomatoes of my own to cherish. As for how I eat my fabulous fruit...simply sliced and sprinkled with salt and pepper. I find that true garden-grown tomatoes are so special I don't want to ruin their flavor with other ingredients. I save that for the supermarket tomatoes. I love the ritual! My ritual is the same as your real one--preferably wait until the sun has warmed the tomato slightly, pick it and wipe it on the seat of my pants if it's been on the ground and eat it while standing over the tomato plants, breathing in the scent of the tomato plants and listening to the bees buzzing in the blossoms. This is great! It makes my 'stuffing the first asparagus spear of the season into my mouth while in the garden' seem almost barbaric! I hope to take a thick slice, drizzle a bit of olive oil on top, salt and cracked black pepper, plus two basil leaves from my garden on top and have a slice of fresh mozzarella on the side.